This year, while celebrating the anniversary and legacy of the insulin discovery made by Drs. Frederick Banting and Charles Best at Toronto General Hospital, we reflect on how much has been achieved since then. While the diabetic population at UHN represents the growing global Diabetes epidemic, the POCT glucose meter technology embraced at LMP offers clinicians the most advanced tools to better manage patient care. The preparation phase for the meter replacement project was long and the implementation period was intensive. ‘Presently, there are more than 461,000 POCT glucose meter results that reside in EPR, as they should be’, proudly states Christine Cursio, POCT Manager. Implementation began with each clinical unit identifying the best location for their glucose meters, followed by the installation and activation of network jacks. Shortly afterwards the POCT team delivered docking/charging stations. 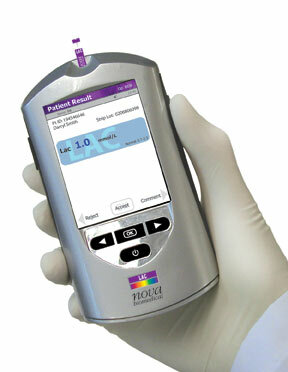 LMP was instrumental in mapping the network settings so that the flow of the patient glucose results from this tiny meter flowed seamlessly into the EPR. Just to appreciate the volume of work performed, there were approximately over 250 of these docking stations installed throughout UHN inclusive of the sites at Toronto Rehab. While installation activity was happening, intensive training of the RNs and Health Professions staff took place. Preparation for the hands-on training, the staff were required to complete the “Glucose Meter Overview” E-Learning module that contains ‘how to’ slides followed by test questions. Nova Biomedical representatives trained up to 80% of the staff. The meter practical training ensured that the operators became skilled at the functionality of the device, how to execute the QC and access for the acceptability, how to order a patient test in EPR and run properly on the device. The ‘Train the Trainer’ teaching model was utilized for the select Super Users, who in turn would train operators on a continuing basis. During the implementation phase, the POCT team was a source of contact and reference for concerns and up to date information, and implementation in-person support was provided on the units. ‘Since the implementation of the new glucose meter, improvements have been made around practices for managing hypoglycemia’, proudly notes Lori Taylor Nursing Professional Practice Leader. “The single vendor platform allows for standardized education, and clinicians access to EPR results trending, previously buried in the paper documentation”. In May 2013, “Diabetic Trending Report” was launched in EPR for TGH and TWH. The report collates all POCT glucose results alongside patient’s diabetic medication. One of the meaningful future applications of this new report is to trend all diabetic patients’ results against best clinical practice. EQA is an essential part of the POCT analytical process allowing POCT MLT to assess meter/ user performance. During the most recent EQA survey, POCT MLTs performed QMPLS Survey and audits in each clinical area practicing POCT Glucose monitoring. Again, we had an opportunity to connect with a lot of operators and it was another chance to observe analytical performance, listen to the feedbacks and fine tune some performance techniques. As of today, we have two provincial proficiency testing surveys under our belts using Nova meter and the most recent QMP-LS response was very favorable and without any outliers. With a bit of a learning curve, we at POCT are also becoming more proficient in our AegisPOC data management program. This helps us maintain the quality of the glucose meter program. For example, operators that fail to perform two levels of QC during the first 6 months of training will be locked out of the meter; thus being unable to perform patient testing. To be activated again, they have to repeat the training program. Reflecting on this project, the POCT Manager says that the highlight of the project was when Transplant Unit went live as our first clinical area to use a new meter and they embraced it with such enthusiasm, she knew that we will be “OK” and the rest of the project would progress.” Given what we achieved to date, I am very happy” says Chris. In June 2013 TR sites also underwent implementation of the Nova meters, following similar path; completing the projects execution phase. We are glad to act as a resource having the expertise that we established and perfected few months earlier.